Quick Reviews of 3 Top-Rated Python IDEs « Adafruit Industries – Makers, hackers, artists, designers and engineers! Are you learning to code with Python? Perhaps you’re teaching yourself how! 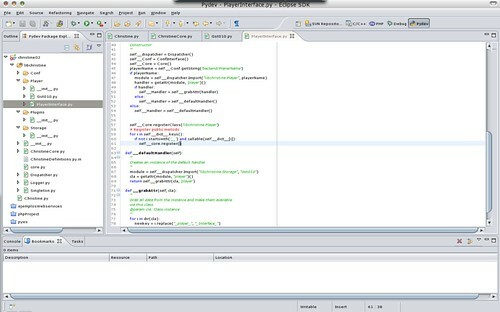 OpenSource.com’s Jason Baker takes a look at 3 of the top Python IDEs currently available: PyDev, Eric, and PyCharm (with honorable mention of PyScripter, LeoEditor, PTK, IDLE, Bluefish, Geany, and Spyder! Lots of options out there!). Python is everywhere. These days, it seems it powers everything from major websites to desktop utilities to enterprise software. Python has been used to write all, or parts of, popular software projects like dnf/yum, OpenStack, OpenShot, Blender, Calibre, and even the original BitTorrent client. It also happens to be one of my favorite programming languages. Personally, Python has been my go-to language through the years for everything from class projects in college to tiny scripts to help me automate recurring tasks. It’s one of few languages out there that is both easy to get started with for beginners yet incredibly powerful when beginners graduate to working on real-world projects. To edit Python programs, you have a number of options. Some people still prefer a basic text editor, like Emacs, VIM, or Gedit, all of which can be extended with features like syntax highlighting and autocomplete. But a lot of power users working on large projects with complex code bases prefer an integrated development environment (IDE) to the text editor plus terminal combination. The line between an advanced text editor and a slim IDE isn’t always clear, and we’ll leave it up to you to decide exactly which features you require for your development needs. Let’s look at some of the most popular options available to Python developers and see how they stack up. All three are cross-platform and can be used on your operating system of choice.